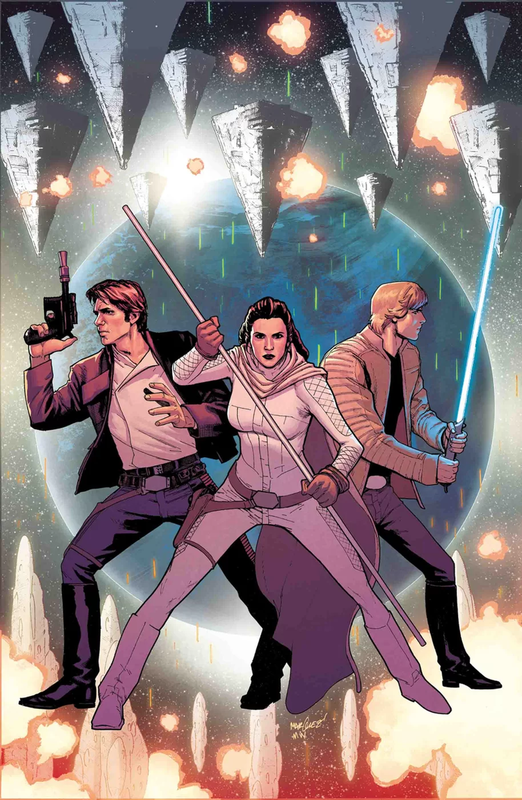 Star Wars #49 is mostly a space battle. It opens with the Empire launching bombers to attack the Mon Cala ships. Ackbar rallies the Rebel fleet to jump in-system and assist the Mon Cala. In the middle of the chaos is Leia, Han, Luke, Chewbacca and company in the Millennium Falcon. There’s lots of shooting, explosions, and the good guys win in the end…kind of. So, there’s a space battle. Keep in mind this is after the destruction of the first Death Star but before The Empire Strikes Back. The Mon Cala have a sizable force of vessels they commandeer and make their escape on, and Ackbar brings in the fleet he has. Together, they actually defeat a large fleet of Imperial Star Destroyers. Of course Ackbar does have to pull a trick to make it work, one that ties into the Solo movie. Afterwards, Leia and company drop off the changeling, and then there’s a several month gap as they jump to Mako-Ta Base. There the Rebel fleet is assembled and Leia meets with Queen Trios. They have a little chat, and then the comic ends on a major cliff hanger. It’s a nice way to ramp up the interest in what’s to come. With a big space battle taking center stage, there’s lots of opportunity for the artists to have some fun. There’s big panels of the fleets showing off different styles of Mon Cala ships. There’s a cool full page panel of Ackbar leading the Rebel fleet into combat, which uses overlays to make the whole thing seem like one seamless image. And then there’s battle panels as the forces engage. Overall, the artwork is really good with great coloring. As for the story, it’s pretty good. With the big action set piece, there’s moments for the characters to be chatty, and the twist at the end was a gut punch for what will happen next. I also liked the moment where C-3PO felt his acting abilities were recognized. But I did feel like Ackbar’s trick to breaking the blockade was a little overdone. We’ve seen this in Star Wars Rebels, Rogue One and The Last Jedi. It would have been nice if they could have done it without sacrificing anyone because the Rebels are starting to feel really suicidal. And there was an odd panel that appeared to show the Mon Cala regent being blown up underwater, thought it’s not exactly clear as the panel just kind of comes out of nowhere without much setup. Not all of the dialog is great, but it’s not bad, just good or okay. In the end, the story is interesting and dialog gets the job done, but I won’t say there wasn’t some room for improvement. With a good story and nice artwork, I give Star Wars #49 a four out of five metal bikinis. While the Mutiny at Mon Cala might be over, the Rebel fleet is far from safe. I do wonder how this is going to lead into The Empire Strikes Back. Will the battle of Hoth wind up being a follow-up attack on the destruction of their fleet?